The total water consumption in Lesotho is about 2m&#179;/s, while the total availability is about 150m&#179;/s. 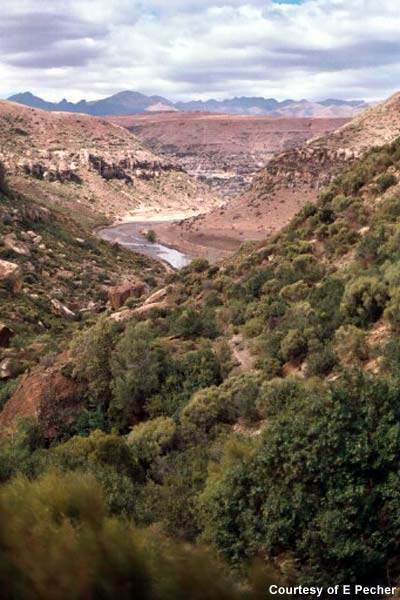 Orange River flows about 2,000km westwards from the Drakensberg mountain region of Lesotho through South Africa. The topography of the region will assist with the project, which will provide revenue for Lesotho and supply the country with hydroelectric power. The total cost of the four-phase project is expected to be &#36;8bn. LHWP will have five dams and about 200km of tunnels and water transfer works constructed between the two countries. Lesotho Highlands Water Project (LHWP) is the largest bi-national infrastructure project between Lesotho and South Africa. It involves the construction of an intricate network of tunnels and dams to divert water from the mountains of Lesotho to South Africa. It will provide water for South Africa and money and hydroelectricity for Lesotho. Lesotho Highlands Water Commission (LHWC), previously known as the Joint Permanent Technical Commission, is a bi-national commission consisting of three delegates from each country. It is responsible for monitoring the project. Lesotho Highlands Development Authority (LHDA) is responsible for the project’s overall implementation works such as dams, tunnels, power stations and infrastructure on Lesotho’s borders. It reports to LHWC. Trans-Caledon Tunnel Authority (TCTA) in South Africa is responsible for tunnelling, delivery, integration and flow control of water into the Ash River outfall in South African territory. The project is being undertaken in phases. Phase one was completed in 2004 and was intended to supply water from Lesotho to South Africa. 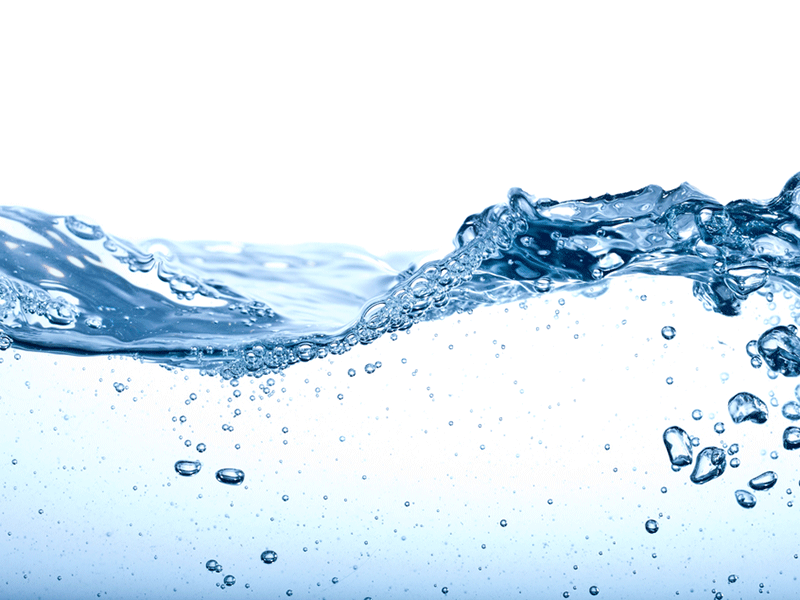 About 4.8 billion m³ of water had been transferred by 2007. Feasibility studies for phase two began in October 2005 and were completed in May 2008. The second phase of the project has been approved by the Government of South Africa. Lesotho and South Africa signed an agreement in 2010 to undertake the project. Phase II of the project is estimated to cost approximately $1bn (R7.3bn) and is projected to deliver water by January 2020. 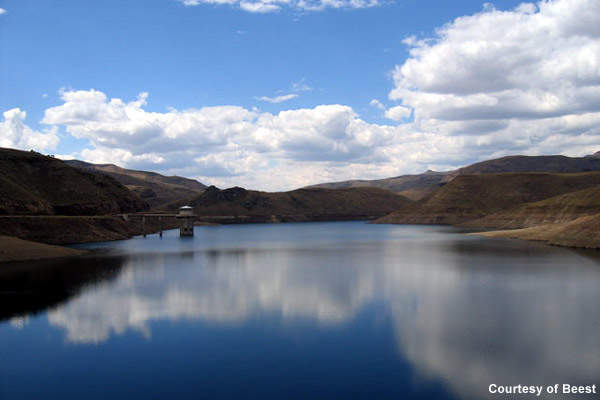 Lesotho has abundant water resources that exceed requirements for possible future irrigation projects and development. The total water consumption in Lesotho is about 2m³/s, while the total availability is about 150m³/s. 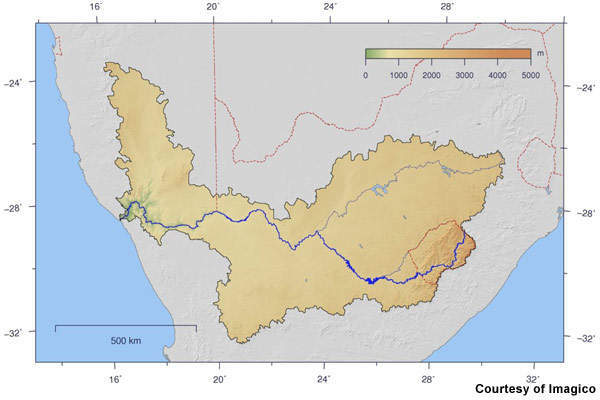 Orange River flows about 2,000km westwards from the Drakensberg mountain region of Lesotho through South Africa into the Atlantic. 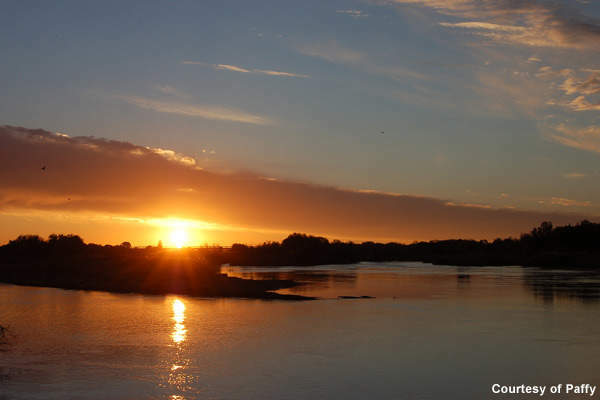 About halfway along its length it is joined by the Vaal River, which flows from the north-east. The water has low sediment content and is of good chemical quality. 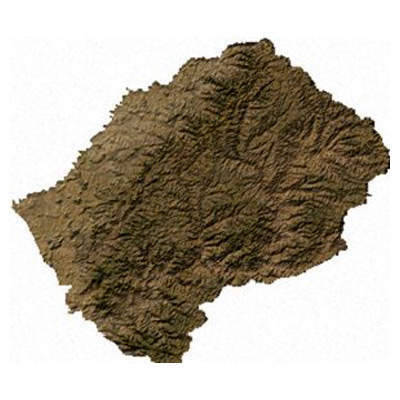 The topography of the region will assist with LHWP, which will provide a source of revenue for Lesotho and supply the country with hydroelectric power. The project will also accelerate development in the mountains. In the 1950s British High Commissioner to Lesotho Sir Evelyn Baring identified the LHWP as the most economical way of supplying water to South Africa. A feasibility study for the project was undertaken by the countries in 1978. A more detailed feasibility study was conducted by the Lahmeyer MacDonald Consortium between 1983 and 1986. The study found the project was economically viable and would allow hydroelectric power generation. A treaty was signed by Lesotho and South Africa in October 1986 regarding the project design, construction, operation, maintenance and water transfer. South Africa agreed to pay the water transfer costs and Lesotho agreed to finance the hydroelectric power projects. A detailed engineering and services analysis was undertaken for phase one, which involved phase 1A and phase 1B. Phase 1A required 2,800ha of rangeland and about 1,504ha of arable land and involved about 2,900 households being relocated. Phase 1B required 3,353ha of arable land and 3,434ha of rangeland and involved relocating 500 households. Phase 1A included construction of the 185m-high double curvature concrete arch Katse Dam in the central Maluti Mountains and the 72MW Muela hydropower station. The dam has a storage capacity of 1,950 million m³ and a spillway discharge of 6,252m³/s. Phase 1A also involved building a 45km transfer tunnel and a 37km delivery tunnel. Phase 1B involved construction of the 145m concrete-faced rock-fill Mohale Dam on the Senqunyane River. The dam has a storage capacity of 958 million m³ and a spillway discharge of 2,600m³/s. A 32km interconnecting transfer tunnel between the Katse and Mohale reservoirs was also built. Phase 1B included construction of the 19m-high Matsoku Weir and a 6.4km transfer tunnel. Mohale Dam was inaugurated in 2004. Phase II of the project includes construction of the 165m high Polihali Dam in the Mokhotlong district. It will be a concrete faced rock fill dam (CFRD) with a capacity to hold 2.2 billion m3 of water. A 38km water transfer tunnel running will be constructed to connect Polihali with Katse Reservoir. The second phase also includes a 1,000MW pump storage system. During phase III the Tsoelike Dam will be constructed at the confluence of the Tsoelike and Senqu rivers, about 90km downstream from Mashai Dam. It will have a storage capacity of 2,223 million m³ and a pumping station. During phase IV the Ntoahae Dam and a pumping station will be built about 40km downstream from Tsoelike Dam on the Senqu River. LHWP will have five dams and about 200km of tunnels and water transfer works constructed between the two countries. The project will transfer about 2,000 million m³ of water from Lesotho to South Africa every year. The supervising engineer for construction of the Katse Dam and 45km transfer tunnel during phase 1A was Lesotho Highlands Consultants. The construction contractor was Highlands Water Ventures. Construction of the Muela hydropower station and tunnelling was supervised by Lahmeyer MacDonald Consortium. Contractors for the tunnelling included Balfour Beatty, LTA, Spie Batignolle, Ed Züblin and Campenon Bernard. Electrical and mechanical work contractors included SDEM, Neyrpic and Deutsche Babcock. Equipment for Muela power station was provided by Kvaener Boving, Norelec and ABB Calor Emag Schaltanlagen. The construction of Mohale Dam was supervised by Mohale Consultants Group. A joint venture of Concor Engineering, Hochtief and Impregilo (lead contractor) was formed for the project. The mechanical and electrical works contract was awarded to an ATB joint venture. Lesotho Highlands Tunnel Partnership was the design and consultant supervisor for the transfer tunnel between Katse and Mohale. The contractors were Hochtief, Impregilo and Concor. The design and supervising consultant for Matsoku Weir and tunnel was Matsoku Diversion and Consult 4 partnership. The construction contractor was Matsoku Civil Contractors. The phase two feasibility study contract was awarded to the C4-SEED joint venture. The venture consisted of companies from both countries: Consult4 of South Africa and Senqu Engineering Environment and Development Consultants of Lesotho. The total cost of the four-phase project is expected to be $8bn. Phase 1A was expected to cost $2.5bn and phase 1B was expected to cost $1.5bn. The funds were issued by the World Bank, which also coordinates fund mobilisation from other financiers including the African Development Bank, the European Development Fund, Development Bank of South Africa, European commercial banks and several export credit agencies.